Acrylic paint, matted, 30x40 in. This piece marks the completion of my second quarter at SCAD! For this color theory final assignment, I was asked to draw inspiration from previous projects and recreate something on a larger scale of at least 40 inches – that’s over three feet tall! So, I chose to work with my Mondrian painting and combine it with a concept from my Hue, Value, and Intensity project where I painted a pattern’s complementary colors. 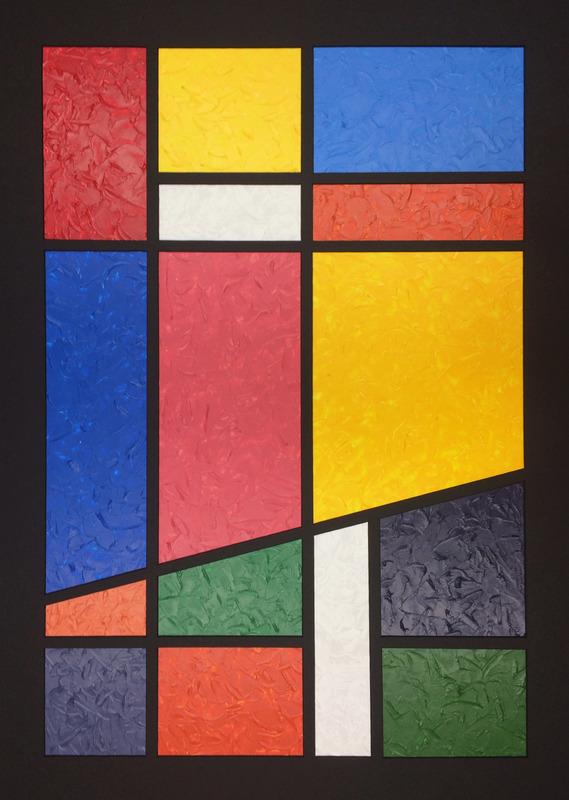 Here, I cut the bottom of my Mondrian at an angle and painted it with the complementary hues to add some variation. I also experimented with using my palette knife to apply paint and create rough textures as an offset to the plain, solidity of a traditional Mondrian piece. The black border and lines you see are actually a mat board sitting on top of the painting; I thought that adding another plane would enhance the project’s textures and three-dimensionality even more. In order to create the mat, I spent about two hours measuring each line and cutting the boxes individually, but the time was well spent because I’m very happy with how it turned out. This large-scale modern art will look great on the walls of wherever it ends up!